I do it all the time. Many of these projects are aborted or recycled before they can see the light of day but I've recently started one I think might go somewhere. It has been my intention for a while now to do a few AoS28-inspired war bands. I've already started work on 'The Brides of Nagash' and 'The Reliquary of St. Leonis' which should hopefully materialise some point in the coming months alongside my Flesh-Eater Courts army. 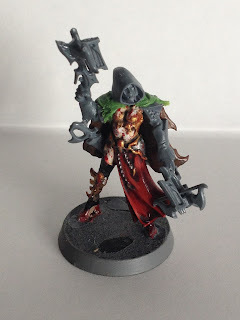 After reading City of Secrets, which was a fun little book I'd recommend that really fleshed out what non-Stormcast people get up to in the mortal realms, I couldn't help but be inspired to chop up a long neglected miniature of Crone Hellebron I've never used for anything and see what I could make of it. Apologies in advance for the bad photography, I happen to have limited means of taking photos presently. The result was this charming lady who ended up looking more of an assassin than the Scourge Privateer Captain I had envisioned. 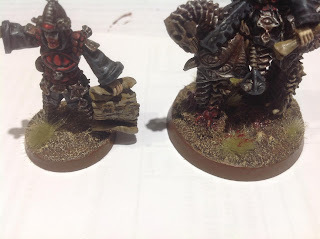 I therefore decided to try making such a miniature and began raiding my Dark Elf bits box. 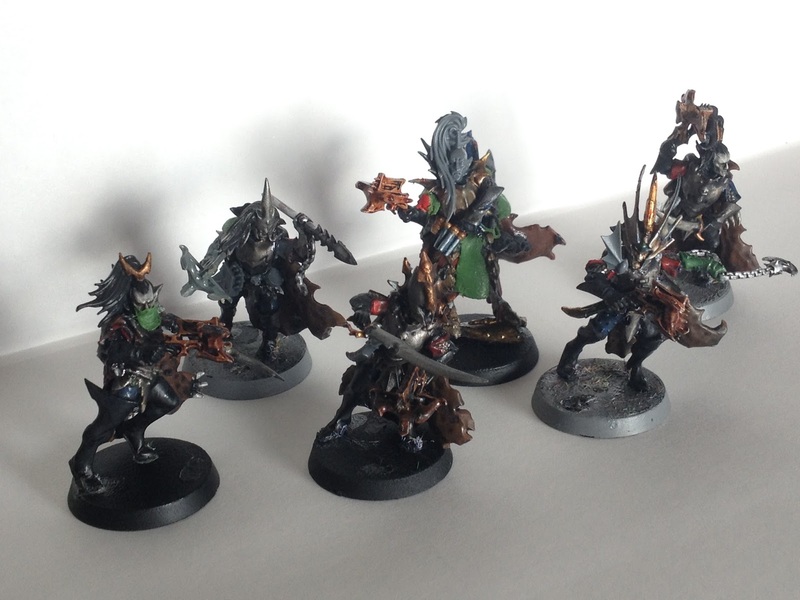 Before long I found myself chopping up a few Black Ark Corsairs and I have ended up with a little war band of elven pirates with which to reave the seas of the mortal realms. I did have to cringe a little seeing the paint on these miniatures as I think these corsair pieces were done about ten years ago now. Hopefully I shall be giving them a new lease of life with a fresh lick of paint sometime soon. I certainly had a lot of fun with these miniatures. 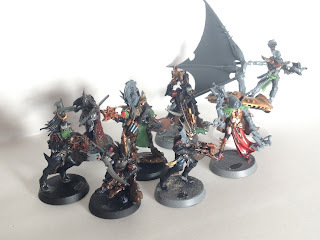 The Corsairs were my first plastic Dark Elf miniatures and I really enjoyed building and customising them back in the day. Now that the corsairs no longer need to be ranked up I could have even more fun with their poses and weapons. This was merely my first endeavour in seeing how far I could push the Corsair kit and I'm really tempted to pick up another box to see what other dynamic poses I can pull off. 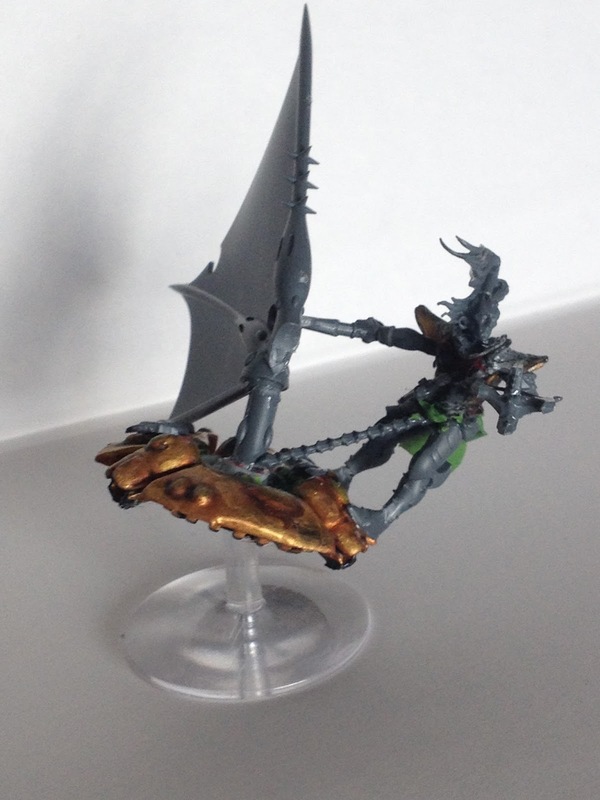 While looting some of my elf/eldar bits boxes I came across a spare sail from the Dark Eldar Raider kit and some kind of Eldar grav-platform I think is part of a Guardian heavy weapon thing. An idea took shape and now this thing exists. Not sure what to call it but I'm imagining it as some kind of magical wind board that flies along the currents of sorcerous energies that blow through the realms. I also found out some Lothern Sea Guard that currently don't have a home and I'm thinking of converting them with Corsair bits to make them into a little group of harbour guards that protect the on-land interests of the Scourge Privateers. A while ago I also kit bashed a Sorceress on Dark Pegasus, which I may add to this group for some magical support if I can find what I've done with her. With regards basing I think I might repeat the kind of basing I did on my Hobbit Collection, in order to simulate the planks of a ship. I think I might even have the mould I made for the Goblin Town scenery laying around somewhere, though I think I might paint the wood in a lighter brown than I did with the Hobbit stuff. As for painting I'm not really sure what I am going to do with them. I'm currently leaning towards a bit of a reinvention of my old Dark Elf Army scheme with reds and golds but far brighter to reflect the more mythic-fantasy setting of Age of Sigmar better.